The beauty of Vessel 365 is the alignment of all SubChapter M recordkeeping standards under a single roof. MarineCFO, the Houma-based maritime technology innovator and workboat solutions thought leader, announced the much anticipated Vessel 365 Subscription Program will commence in concert with the SubChapter M Final Rule effective date of July 20, 2016. SubChapter M requires towing operators to maintain a towing vessel record or equivalent process to meet inspected towing vessel documentation requirements. Vessel 365 blends logs, checklists, forms & document management into a seamless onboard and shoreside compliance tool. “The beauty of Vessel 365 is the alignment of all SubChapter M recordkeeping standards under a single roof. Chronological logs, navigation assessments, navigation training, drills & training, oil residue log, fire system assessments, preventative maintenance, nonconformity workflow, and document management create a fully compliant towing vessel record. The USCG required Sub M correction and preservation standard is simple and straightforward,” explained SubChapter M expert and MarineCFO Vice President, Rocky Marchiano. “Vessel 365 is fully functional onboard without any internet connectivity. Only data replication requires an internet signal. This is a tremendous savings to the vessel’s operating budget,” lauded Chief Engineer Steve Kelley of Triton Marine. 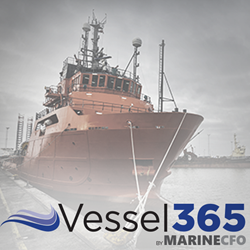 The web-based subscription package may be accessed at http://www.vessel365.com and includes the MarineCFO proprietary “On Boarding Wizard” which populates vessel particulars, assessments, planned maintenance, and document management within minutes. Subscription options are annual and monthly with a “stacking” option for reduced operating periods. MARINECFO Mission Statement: "Through technology thought leadership, provide products and services that empower workboat operators with Vessel Enterprise Resource Planning through sustainable data collection, tasking, and decision making tools."